HomeHeadphone ComparisonsAKG Q701 vs. K712 | TRICKY COMPARISON! AKG Q701 vs. K712 | TRICKY COMPARISON! The AKG Q701 vs. K712? An interesting comparison indeed; Especially given that we have to discuss the Q701 bass mod, that some nerds decided would be a good idea 😛 Just kidding. But yeah it makes for a strenuous comparison because of that added factor. Before we get into the specifics .. Frequency response: 10hz – 39.8khz. Color: Choice of White, Black, & Neon Green. The Quincy Jones model 701 is the 2nd newest model in this series, right behind the 701 anniversary edition. It has more bass than the 701, and is overall a better, livelier headphone in general. It has a detachable 10 or 20 foot straight mini XLR cable, and sports those super comfy velour ear cups. The self adjusting headband is still convenient as ever, and the ear-cups are about as big as two tires. Lol. They do a fantastic job with melons of all sizes, and really keep the drivers away from touching your ears. They are also wide and round enough to fit just about any ear, Ross Perot included. 😀 Do understand that these are open back, and will leak sound. They are quite neutral, flat, and true to the source. Be aware that they aren’t really made for on the go, as they are big and bulky with a long cable. However, you can purchase an aftermarket 3 foot chord. Just be aware that people may be annoyed when you blast Big Willie Style on the bus. Lol. 1997 anyone? Great 3-d Sound-stage It’s huge. Some say it’s a bit unnatural, but overall it makes for one heck of a great listening experience. The sound-stage gives off a nice width and depth. Very flat, although not quite exactly neutral. They do have some color to them, which a lot of people will be excited about. They also have more bass impact than the 701’s. Very nice mid-range presence, much like the 701’s. There is a spike around 2khz, but like the 701’s it adds a certain energy to the tracks, especially vocals. The mids are there, and they are a bit in your face.. but they never sound harsh or grating to your ears. The treble is very revealing. You really get a lot of lush detail. They sound really sharp, but they may take a little while to get used to. The headphones are just that honest. Exciting. The Q701’s have a quality that will get you pumped up about the sound more so than say the Beyerdynamic DT880 or Sennheiser HD600. They are a little more colored if you will. Very lively, but still honest .. and not harsh. What more could you ask for? Still bass “light” to some. Sound-stage still may be too wide to some, but this is nitpicking. Treble range may sound a bit harsh at first. Didn’t see too many things that people were going back and forth on. Check out this really informative review! Metal571 is quickly becoming one of my favorite reviewers. He really has an honest and straightforward approach, and tells it like it is while also remaining really informative & insightful! Check out the bass mod! Great for FPS gaming and music in general. They have such a lively flavor and sound to them, even being marketed as neutral. They are very flat and neutral, but not 100%. This actually makes them a lot more versatile and prevents the sound from being too boring like the K701. Any genre of music will suffice with these puppies, but..
Bass-heads: Avoid. While the Q701 does have more bass than the K701, it’s still lean. Expect an honest, textured, and detailed signature. Don’t expect to be blown away. The Q701’s are not quite 100% neutral, but close to it. They have an extra bit of bass emphasis, and the sound-stage is markedly improved from their 701 predecessor. This is a headphone that you will have a lot of fun with, as it’s less cold and analytical overall. Mind you, it’s still a clinical can meant for mixing and reference, but there’s also great potential for pure enjoyment. You will hear such great detail and clarity in the treble range, and the mid-range has a slight bump which brings out vocals and instruments with startling realism! Frequency response: 10Hz to 39,800 kHz. Material: Leather headband, plastic, memory foam. Far and away these are open back headphones meant for mixing and reference. They are clinical and revealing, but not COLD. The K702 (and the 701 for that matter) have both been accused of being a bit cold and heartless at times. The K712 is not. It haz a nice warm heart 🙂 It thrives in an isolated studio and home environment, away from distractions. You won’t really want to wear these out in public, as they leak sound and people will be able to hear what you’re listening to. They also have a great sound-stage. It’s realistic, but not abnormally large like that of the K702. What is Soundstage? Some say the mid-range is it’s strong suit, a couple people pointed out that they may be a bit recessed, grainy, or muddled. Overall these are very very accurate headphones, with great balance, smoothness, and a natural Timbre. What is Timbre? Great Soundstage with a phenomenal sense of space. It’s improved upon and no longer abnormally wide like the earlier K7xx models. Extremely accurate, balanced, and smooth. Full, accurate, and tight bass response. I came across something really neat when reading about this. If you take the M50x’s bass and compare it with the 712, you may hear the same subtle sounds, but the 712’s have this way of really jumping out at you, while the M50’s are more subdued. The 712’s have this really nice texture and nuance to them. They may make the hair on the back of your neck stand up! Natural Timbre. Very similar to the Sennheiser HD 650 in this regard. Lightweight and extremely comfortable. Great for long listening sessions. Comes with 2 cables, coiled and straight. May be some issues with the treble being more “upfront”, and bright in certain songs. Some say it needs to be EQ’d down a bit. Quality control issue? Only saw this once in about 13-14 pages on amazon, but it’s noteworthy nonetheless. A particular reviewer said that his left headphone driver kept going out. He sent it back and received a new pair only to suffer the same issue. What is a headphone driver? The velour carrying bag is nice, but given that the headphones are very lightweight and somewhat fragile, a hard case would have been ideal. Mid-range. As mentioned earlier, a lot of people said the mid-range was the highlight of this headphone. Some didn’t, and called it recessed/muddled. 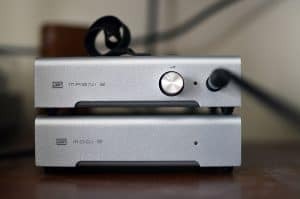 Still, it’s been compared favorably to the HD 600’s fantastic mids. Easy to drive? I will get into this more in a jiffy, but some said the 712’s are a pain to amplify. Still as I read each and every review on amazon, I came across a plethora of different amp set ups that people were using to fine effect. They aren’t very forgiving in the upper mid-range and treble. Be aware of your source files, and try to use lossless, .wav files as well as high quality Mp3’s (320 Kbps). Not actually manufactured in Austria, but rather Slovakia. Most didn’t see an issue as the sound quality is still top notch. Others found it deceptive to deliberately put the wrong location inside of amazon. Good build quality despite it’s lightweight construction, but some have noted that they do feel a bit fragile and dare I say “cheap”. Those three options are pretty stellar, and have been known to pair well with the K712. These do remarkably well with most genres. They are perfect for mixing/reference in an isolated studio environment, and have been endorsed for gaming quite a bit. In fact, they just may be the best gaming headphone out there, which is pretty amazing if you ask me considering they weren’t really built for that specifically. One guy even said his online gaming community tried to ban him because he can hear the enemy so far away that it gives him a distinct advantage over his opponents. He could hear pretty much everything with pinpoint precision accuracy. Timpani (Yes someone said they were good with tuned timpani. Sounds like some sort of fish fry lol). Bass-heads. Yes it’s bass is quite impressive, but I wouldn’t get this headphone solely for Rap/Hip-hop. Hard Rock. May have a bit too much bite and up-front sounding mid-range. This will diminish over time however. The K712 is a great all around headphone if I had to sum it up quickly. It does well with most genres, and it’s bass has more impact than the K702. It’s sound-stage is also improved over the 702s in that it’s not quite as unnaturally wide. Overall, it’s a remarkably musical headphone that has that “fun” factor. Some have said it needs a burn in period to open up, and ultimately does need amplification to power correctly. Note: With the Q701 bass mod, these two headphones are very similar, and there’s almost no glaring differences. Still there are some subtitles which I will outline now. Some even say that the K712 is the exact same as the Q701 with different padding, thus changing the sound signature a little. Both have the same frequency response. In fact, both have the exact same specifications. Both have a similar build and aesthetic. Each has a detachable mini XLR cable as it’s connection. Both do well with a similar range of genres. Both are extremely comfortable, and need almost no adjustment even over long listening periods. With mod, the bass level is about the same. Without the bass mod for the Q701, the K712 does have more bass. This is debatable, but from the research I’ve done, the mod is indeed effective. The K712 has a slightly more extended treble than the Q701. The K712’s low mid-range is slightly more forward in nature than the Q701’s. The Q701’s sound-stage is a bit more open/spacious, and airy. There may be ever so slightly more bass on the K712 even over the modded Q701. Please keep in mind all of this is about as subtle as it gets. The modded Q701 may be a bit more neutral overall than the 712. The K712 as discussed above has a slightly warmer signature. K712 may be a bit more forgiving of low bit rate files (128 Kbps). Just don’t get into the habit of using poor quality files with a headphone of this caliber. Comfort. The Q701’s have those bumps on the headband that many complained about with earlier models 701 and 702. The K712’s don’t have these and are therefore more comfy. Soundstage. Some say the sound-stage is less outrageous/extreme in that all important center image. If you remember from my AKG Q701 vs. K701 review, the Q701 improved upon that flaw that was apparent in the K701 (abnormally large sound-stage). The K712 is said to improve upon that even more. Just know that the difference may be slight, as the Q701’s sound-stage has been called pretty incredible. If you don’t want to bother with the Q701 bass mod, then I would go with the K712, as it’s overall a better headphone. Just be aware that the differences aren’t extraordinary. SEE THE K712 ON AMAZON FOR YOURSELF!! If you are the adventurous type and don’t mind a little bit of a challenge, the Q701 mod will save you a lot of money. When modded, it’s almost identical to the K712. The differences mentioned above are for the most part, very minuscule. If you’re looking for the absolute best mixing/reference headphone in it’s class or otherwise, my top recommendation is the Sennheiser HD 600. It’s about as flat and neutral as it gets overall, and serves as a benchmark for which all other headphones should be compared. It’s been called the Gold Standard, a Genre master, and perhaps the best price to performance ratio out there. A+ numbah one headphone! Well that’s about it for today my friend! I hope you’ve come away with some valuable information in this AKG Q701 vs. K712 comparison review.. Questions? Comments? Requests? Did I leave something out or get something wrong? Please reach out in the box below or Contact me! I would love to hear from you. Which of these are you more likely to go with? Let me know as well! I’ve been through so many reviews for headphones and I’ve seen some bad ones. I have to say though yours is by far the best! I can actually see what I’m getting. All the specs are laid out and organized in a manner that’s easy to read and I love how you compare the two of them and give several places to buy them! Thanks for stopping by. I really do put a lot into these reviews. I appreciate the fact that you pointed that out actually. I do my best to make things as simple as possible here. I want people to receive all the information free of confusion, and my aim is to do that by revealing as much as possible about the product. I agree with Camden–excellent review Stu! I prefer the Q701, sold my K712 after owning both over 3 years… After a long time using the K712 I went back to the Q701 and was surprised that I was hearing some things I was missing with the K712. The Q701 has a lot more inner detail that the K712 and it equates to a much more natural and realistic sound that is more emotionally tangible. Especially noticeable on any music with a strong upper midrange and treble presence like rock guitar. This is priceless Shawn, and should help a lot of people out! Thanks a lot for sharing your experiences!